I would like to thank you all for the warm welcoming you gave me last week. It was very much appreciated and I’m sorry if I’ve worried you. My WordPress family is the best! And now that I have your attention, I’ll take the opportunity to tell you that I’ll be leaving again but this time for far different reasons. I’ve got a couple of things I had planned on doing as the New Year began but that flu bug caused a major change of plans. As a result, I had thought that I’d start a hiatus in a couple of weeks from now but then I received an email. My Zia and cousin from San Marino are coming to the States for a visit! I don’t know much more than that they will be arriving in Michigan sometime Friday. Whether I go to visit them, or, they come to Chicago to visit me has yet to be determined. Either way, though, I cannot wait to see them. So, rather than take time off for their visit, post a recipe or two, and then leave again, I think it best to just start my break a little earlier than planned. As always, thank you for your understanding and, again, for your thoughtfulness last week. I look forward to seeing you again very soon, and, with a little luck, bearing new family recipes. Ah! Finally, the long-awaited agnolotti recipe featuring the filling that was first described to me by a sous chef in Bologna. You may recall that I experimented with another filling when I made Agnolotti del Plin last December. That filling was much softer and, consequently, I used a pastry bag in the process. That wasn’t possible with this filling. From what I learned from that generous sous chef — I really wish I could remember her name — agnolotti, unlike stuffed pastas from other regions of Italy, are primarily meat filled. That’s definitely the case when you compare this 4-meat recipe to my family’s traditional ravioli filling. As I mentioned in the December post, fillings like this one were considered so rich that in Piemonte, where agnolotti originated, they were once served in a pile atop clean table linens, with no sauce or condiment at all. Now this is my kind of finger food! Once you’ve determined a worthy filling — or located a hard-working sous chef willing to divulge family recipes — all that’s left to do is to make the pasta pillows. This is not as simple as one might think. When talking about the various stuffed pastas, aside from the fillings, very often the only other differences are in the shape of the pasta. Tortellini and ravioli, for example, are easy to differentiate. The first looks like a Bishop’s mitre and the second a square pillow, typically cut on all 4 sides. Agnolotti are almost exclusively hand-made and, as you’ll soon see, each is typically cut on 3 sides, the fourth being a fold. What’s this? You’ve seen ravioli made this way? Me, too. Some say all agnolotti are rectangular shaped. There are those that feel square-shaped is preferable. While still others claim that all agnolotti must be half-moon shaped. What? You’ve also seen ravioli made similar to each of these? Same here and that’s perfectly fine in my book. If you place a dish of home-made stuffed pasta before me, you can call them ravioli, tortellini, agnolotti, cappelletti, or pansôtti and you’ll have no argument with me. Deny me a second helping, however, and we’re sure to have a problem. As I’ve mentioned, the filling for agnolotti is traditionally made using roasted meats. Traditionally, yes, but I cheated. I thought it wasteful to roast both beef and veal just to make agnolotti, particularly since I live alone. So, I bought some beef and veal, cut them into medium-sized cubes, and sautéed them in a little butter rather than roast them. This is the same method that we Bartolini use when preparing meats for our ravioli and cappelletti. 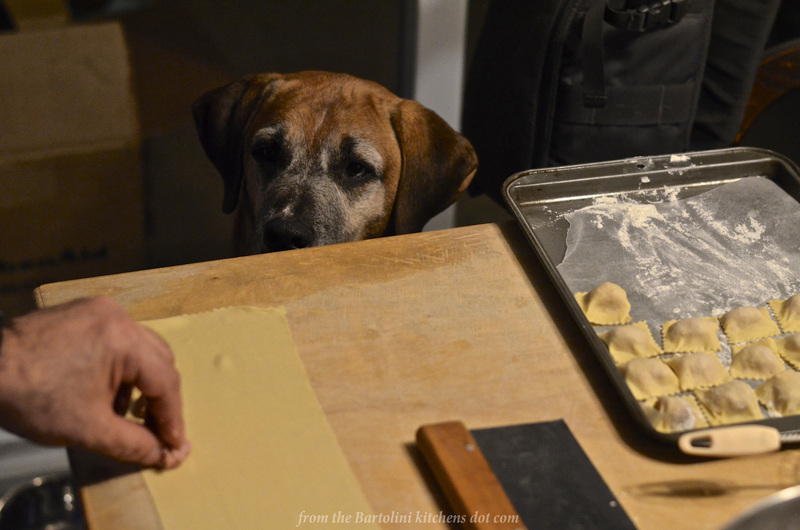 The rest of the agnolotti recipe that I’ve shared is just as I was told by my Bologna sous chef. Gotta love that woman! In a frypan over med-high heat, melt the butter before adding the beef chunks. Season lightly with salt and pepper and sauté until browned on all sides. Set aside. Repeat Step 1 using the veal chunks in place of the beef. Cut both types of prosciutto into cubes. Once all have been ground, add the grated cheese and nutmeg, mix well, and taste to check seasoning. Add nutmeg, salt and pepper, if needed. Cover and refrigerate for several hours or overnight to allow the flavors to meld. At all times, beware of the dog. Make the pasta dough and let it rest for about 30 minutes. Place the dough strip on a lightly floured work surface, Use a pastry cutter to “square off” both ends. Carefully fold the dough flap over the filling balls. Make sure the flap touches the filling balls. This will help in the next step. Use your finger to press the dough between each filling ball before sealing the edge. Try to remove as much of the air as possible. Use a pastry cutter to cut between each agnolotto and to trim away any excess dough. Place on lightly floured linens or wax paper and use immediately or cover and refrigerate if to be used later that day. I’d recommend freezing them if cooking is to be be delayed much longer. To cook, bring a large pot of salted water to the boil. Add the agnolotti, lower the heat to a medium simmer, and cook for a few minutes. They will float when cooked but, if in doubt, taste one. It will take a few minutes longer to cook frozen agnolotti. I served these agnolotti just as the restaurant had dressed their tortellini, with a basic cream sauce. Take some heavy cream and, over medium heat in a small sauce pan, reduce until half its original volume. Add a bit of grated cheese — whichever cheese you used to make the agnolotti filling — and stir till combined. Dress the agnolotti with the cream sauce and serve garnished with more grated cheese and freshly ground pepper. eta: When this was originally published, our friend and honorary Bartolini, Stefan of Stefan’s Gourmet Blog mentioned that he was aware of mortadella being used in the filling. I thought nothing more of it until I was adding this recipe to my upcoming cookbook and checked my original notes. He was, in fact, correct. I had misread my scrawl from that evening, interpreting “meat” to mean beef when, in reality, I had written “mort” for mortadella. I’ve changed the recipe here to reflect the correction. Thanks, Stefan. You’re the best! If you do not wish to use veal or cannot find some that is relatively humanely raised, feel free to use only beef. Cubed chuck works fine. When buying the prosciutto, have them cut you a slice that is about 1/4 to 1/3 inches (.6 to .8 cm) thick. That should give you an amount that will work fine with this recipe. You’ll find that you meat grinder works better if the meat is placed in the freezer for 30 to 45 minutes before use. If you haven’t a meat grinder, you can use your food processor instead. Place the meat into the bowl and pulse-process until ground to your satisfaction, A little texture is a good thing, so, don’t process until the meat is completely smooth. There are 2 types of Italian prosciutto, crudo and cotto. Prosciutto crudo – raw – is the kind that most of us know and that can be found at just about any deli counter. Prosciutto cotto – cooked – is the Italian version of baked ham and is a bit harder to find. If you cannot find prosciutto cotto in your area, feel free to substitute baked ham, low-sodium is preferred. Be careful when adding nutmeg to the filling. A little goes a long way. It’s best to add it in small increments, tasting as you go. Unless you use pasteurized eggs, all tasting of the raw filling should be done before the raw egg is added, to eliminate the risk of salmonella poisoning. The settings for my pasta roller attachment start at 1, the thickest setting, and run to 9, its thinnest. When making agnolotti, I roll the dough up to and including the 7th setting. The amount of filling used will eventually determine the size of the agnolotti. Using a small ice scream scoop, I can maintain about a teaspoon-sized filling ball for all the agnolotti. When cooking any freshly made stuffed pasta, once the pasta has been added and the water has returned to the boil, lower the heat lest the pasta becomes damaged during the remainder of the cooking process. It’s still soup season in these parts and today’s look back focuses on a good one. Stracciatella soup got its name because it looks like torn rags but I guarantee there’s nothing shabby about it. Easy to make and oh, so very satisfying, you can find the recipe HERE. This entry was posted in Home-Made Pastas, Pasta/Rice/Soups (Primi Piatti) and tagged Cooking, Food, Italian, Pasta, Recipes by ChgoJohn. Bookmark the permalink. Have a good break! Looking forward to see you back again, will miss your pasta recipes very much! Happy travels. 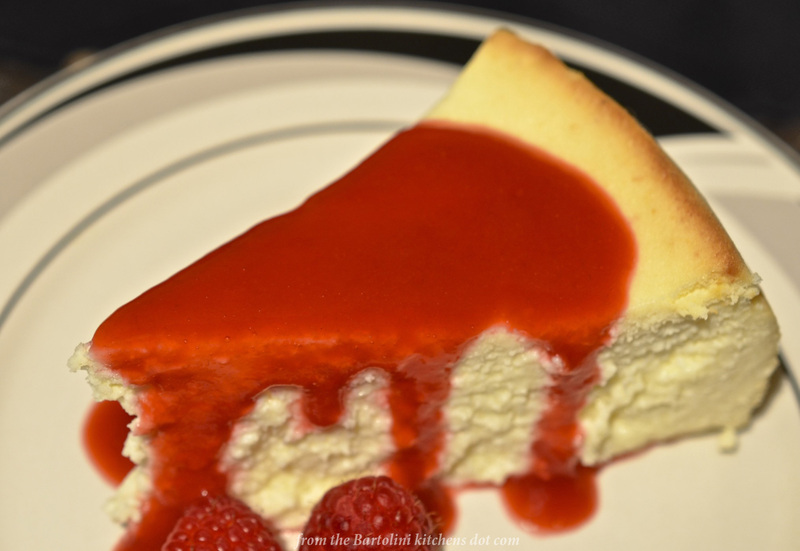 Wonderful recipe – great going away present! 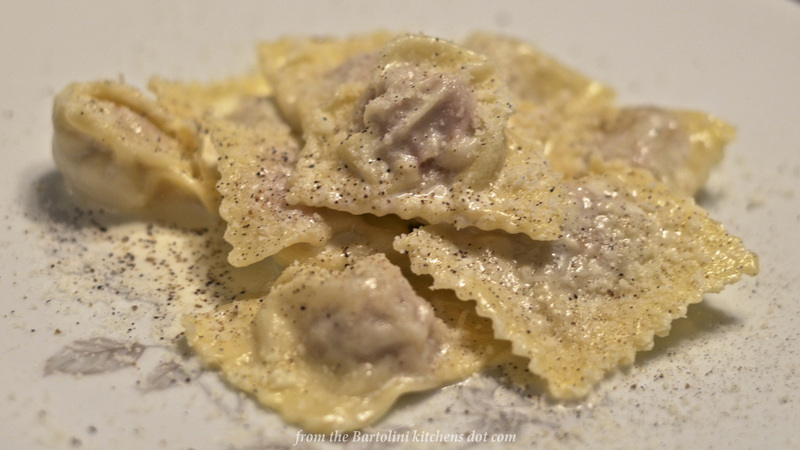 Amazing agnolotti from the Bartolini Kitchens blog. You in my dreams I would love to make stuffed pasta like this. maybe someday I will and I hope so! Hello John. I do so love all the fine details and photos that you provide with your recipes. A real master class, and just lovely to absorb even if one doesn’t plan to make pasta. I especially like the photo of the well seasoned fingers shaping the agnotlotti, and also that hopeful dog. Well now, I see a new pasta project in my future! Nice agnolotti! Oh yum! These would need no sauce for me because the simplicity of quality ingredients would be enough. Love, love the photo with your eager taste-tester … that would be dangerously close for Silas. Enjoy your visit with family and your time to do some things on your list — these are important things. Really beautiful, and the photos steps are very nicely done. You’ve stepped up your game! Enjoy yuor family break, and I look forward to your next posts. What! Off again? 😀 Enjoy — sounds like fun. And fun is a big plate of agnolotti. Terrific stuff. Never made it before — scary name! — but it’s really just a type of ravioli. Really nice — thanks. I was wondering what the difference between agnolotti and ravioli was, thank you John — there is always something new to learn on your beautiful site. Max looks like he was strategizing…hope most of the agnolotti survived, if not all! I know you’re going to think I’m lying but I had a HUGE craving for egg drop soup a week or so ago…I made it using cauliflower which is the way my dear Mom used to make it. Such a wonderful and comforting soup. It’s been ridiculously cold and snowy here too, mind you we were spared by the snow storm we chatted about except it did come back with some fury yesterday. In fact, we had lost power for about 30 minutes, just in time to get all the candles lit and to have a conversation about when to start using the generator (yes, we bought one this year because last year was just brutal with the number and length of power outages we had!). Our infrastructure in our little area is very old and so we have a lot of issues. How exciting that your cousin is coming from Italy — my cousin and his wife are going to visit from Hungary in June for a couple of weeks. I’m excited to show my cousin’s wife (Éva) all the touristy things we only ever do when we have visitors. As FYI, September is a great time to visit. Mmmmm. I’m starving now. I could eat a pound of these little agnolotti (or more!). They look fantastic and I bet they taste even better. I doubt I’ll be making these anytime soon as we’re about to be super busy again this spring as well. Mr. N is in another show! This time up more towards you I believe. I’ll keep you posted. In the meantime, we’re still enjoying leftover roasted duck ravioli. Broke some out this week in fact. Still delicious and the kids devoured it again. 🙂 I’ll tell Mr. N when you post your NY cheesecake recipe. He will be all over that one for sure! It’s by far his favorite dessert. (Well, next to my grandma’s raspberry cobbler.) 🙂 Enjoy the visit with your family!!!! Have a wonderful time John. Love, love the photo of Max! The look of yearning on his face. I don’t seem to have time to devote to pasta yet..but I really want to make your recipes. I will have to put aside some time to break that drab machine in. Have a lovely time with your family, John. Come back with some more delicious recipes! Man these are beautiful. One of my lovely on-line friends from Gourmandistan sent me a pasta roller! I finally can make my own with a machine! I’ll be sure to hit this recipe first! Beautiful. Enjoy your stay with your Aunt and family, John. Thanks for leaving with this fantastic recipe, but please come back soon. Mmmmmmmmm the tastiness is back! Great tutorial on folding agnolotti, John! Sad to see you leave again so soon, but luckily it is for a good occasion. I hope you’ll have a great time with your relatives from San Marino! Looking forward to your return. Enjoy your time with family, John! Just know that all of us will be expecting more wonderful family recipes when you return from visiting. 😉 In the meantime, I shall drool over this delicious agnolotti (much like Max seems to be in that photo)! How exciting is that! I hope you have a wonderful visit and I’m glad that you got the flu out of the way before they arrived (that would have been disastrous). Such a wonderful meal – as long as you don’t turn your back on Max, you should be able to actually enjoy some. Love the first instruction! I must say, your dog looks like a keen pupil indeed, although I suspect it’s eating, not learning, on his mind. These agnolotti look delicious! Enjoy your hiatus, especially since your last one was no fun at all. Looking forward to your return! [Sshh Max! Did he give you a couple? just a couple, huh? Bet they smelled good!!] Oh John, Methinks everyone is so happy for you for this second opportunity to be together with your San Marino relatives in such a short time!! Have a most wonderful time – and unless I am reading incorrectly it may mean you have two zias together both to enjoy your cooking and give you [yes, please!] new family recipes!! May the weather play its part . . . . we’ll be here waiting . . .
We will be here waiting for you! Enjoy! I just love pasta. Your agnolotti look so delicious! There’s nothing like a good filled pasta! Enjoy your time off with family! Have a wonderful break! There is nothing lime time with family, especially those you don’t see often. The agnolotti look absolutely fantastic. I swear someday I really will try to make pasta and will use one of your recipes! This sounds extra fabulous. How can you go wrong with all that meat-filled goodness? What a lovely follow up for all those months of illness, and the weather should be on the improve to for your break and the family visit. Just like Max I wouldn’t be able to think about anything else should that agnolotti be in my presence! …and I forgot to say, have a wonderful time with the family!!! See now this is down side about being away myself, I missed your post last week. Heading over right away to see what has been happening. Love and hugs to you and Max and have a magical time with your Zia and cousin. I had to go back and catch up the news since I also took a week off. Happy to see you’re back on your feet. I see your hands haven’t lost their touch with these super agnolotti. Well, at least if you’ll be away now, it’ll be for pleasure and I hope you’ll have a great time with your Zia and cousin. There’s nothing more intense than the gaze of a hungry pooch! I’ve been away myself John, but glad to see you back with the pasta dishes. Love it. Have a great visit with your family. Is this your cousin’s first trip to visit you? I bet you will be cooking up a storm. “At all times, beware of the dog.” Too funny. Beautiful agnolotti! We had the most wonder lamb ones somewhere or other in Piemonte ages ago, and we still talk about it. Happy visiting with your family! Yes, Max does seem to have the practiced eye for grabbing pasta off the table. What beautiful agnolotti and the filling sounds divine with your combo of meats. I hope you have a wonderful break and enjoy your time with family. How wonderful that they can make it over here for a nice long visit. I’m glad to see that Max was helping you in the kitchen! I hope that you have a wonderful time with your family. That’s one eager pup. Good to see you back John. Great photos looks very tasty! Lovely to see you in my inbox again! Have such a wonderful time with your loved ones. Hope your enjoying your visit with your Zia and cousin!!! thanks for sharing another one of your wonderful ravioli recipes!!! Enjoy the visit and have fun. I love any kind of ravioli and this recipe looks very tasty! I’m always a bit apprehensive at the work it takes, but the end result is always worth it. Thanks for sharing the recipe! I hope your dog was rewarded for all the help he gave you in the kitchen. What a beautiful pasta dish! I can see it being a really fun and worthwhile project to try. Thanks for sharing! We have had many an item meet a bad end in the kitchen for failure to beware of the dog! Hoping that life and/or travels have just been keeping you busy to explain the pause in blogging — always enjoy your posts. Ciao! They certainly disappeared from the serving platter!